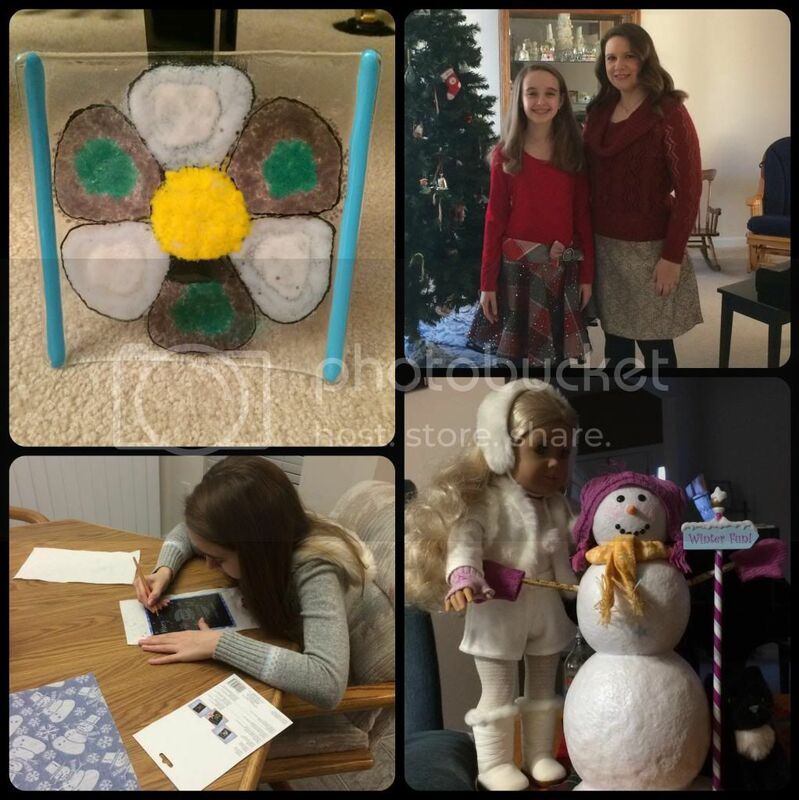 We took off from formal school lessons after December 13th, but Amber has kept up nearly every day with her flute practice and even managed regular piano practice. She also has been working through some math lessons over break as part of an agreement with me due to an attitude issue earlier in December. This accomplished a two fold purpose. Amber learned there are consequences to a smart mouth with a bad attitude and we caught up some of the math lessons from when Amber was much sicker. To say that Christmas was easy with Amber's new diet restrictions would be a flat out untruth. However, it went much smoother than I anticipated. Our family has all been very supportive of the new diet for Amber and they try so hard to make it easier for me to feed her. I can't express how much I appreciate their help. 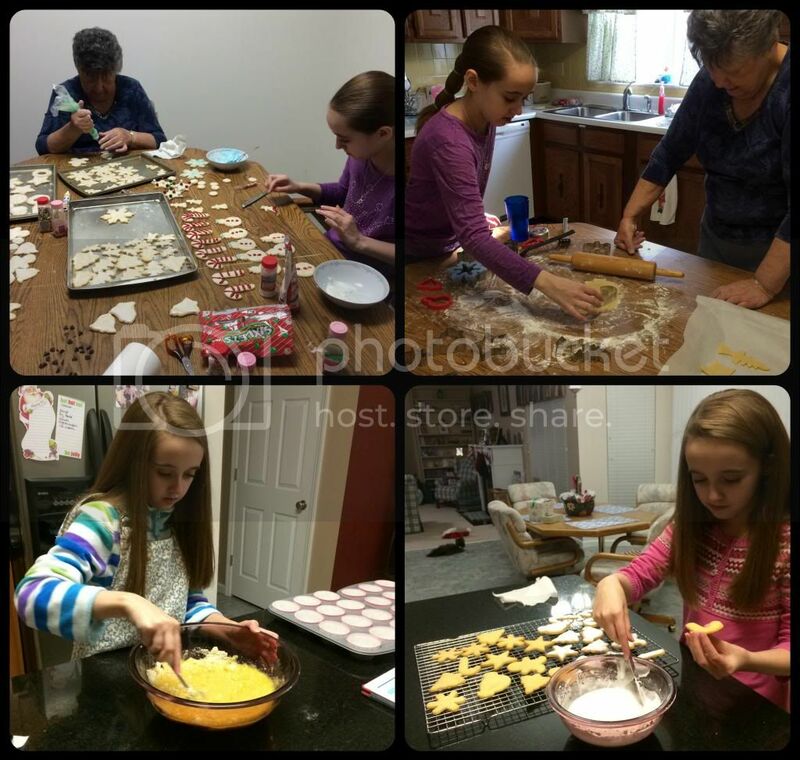 (TOP) Christmas cookie baking with Grandma. These have gluten, but are so much fun and a yearly tradition. My mom has always been patient with others in the kitchen. I am not as gifted. (BOTTOM-LEFT) Amber baked her own vanilla muffins for the first time. They are a staple in her diet right now. (BOTTOM-RIGHT) Fructose free sugar cookies with lower fructose icing. We found a recipe for low fructose sugar cookies that Amber adored, and even with the icing (we made up our own powdered sugar based recipe) she could eat a couple at a time without it triggering a reaction. We also managed to convert our beloved mint brownie recipe to gluten free & low fructose. Life was good. Amber began a green bean trial right after Christmas and the initial results were a success. Granted she only ate 1/8 of a cup of green beans, but it was better than none. After waiting about a week. we tried a 1/4 of a cup of green beans with dinner last night. We are still waiting to see if this will have any adverse affects. We will stop at 1/4 of a cup, because a serving is considered 1/2 cup and in all likelihood is too much. Next up is coconut milk so that I can make coconut milk ice cream. I ordered myself from Amazon a new Cuisinart Ice Cream Maker right before Christmas. (I know... I'm weird but I generally buy certain types of items when I need it regardless of the season, and my family buys as gifts the stuff I would never dream of getting for myself). Anyway, I then realized that Amber couldn't have the coconut milk I planned to use without a food trial. Sigh. We've been making almond milk ice cream instead. While Amber loves her new ice cream, it could be better. However, as Amber failed the banana trial there isn't much, besides corn starch, that I can use to thicken the ice cream. 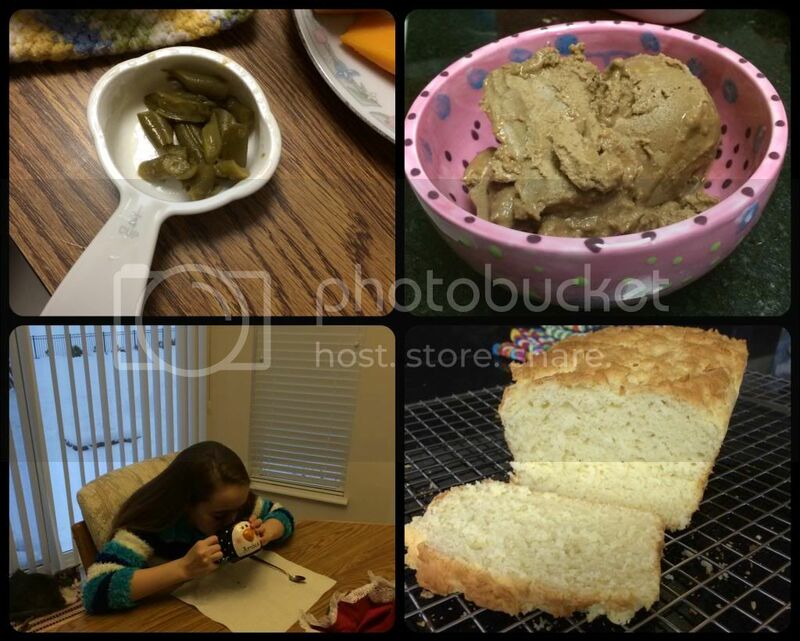 (TOP-LEFT) Amber's green bean serving. (BOTTOM-LEFT) Low fructose (again, just the cocoa) hot chocolate with almond milk. (BOTTOM-RIGHT) A new and improved sandwich bread -very low fructose!!! Amber still hasn't gained any weight since the dietician visit on December 18th, and she's still down 10 pounds. Okay, actually she has gained 2.3 ounces. The dietician and GI doctor want Amber to gain at least a pound a month. 2.3 ounces in two weeks is not going to cut it. Unfortunately, at the GI doctor visit Tuesday the doctor will probably remove Amber from all physical activity until she can gain some weight. We now have to calculate Amber's daily calorie intake, along with her sugar / fructose intake in her food log. Her minimum requirement is 2000 calories per day, but more is desired. She makes the 2000 each day and hits 3000 on some days, yet we are still not seeing a lot of weight gain. On the dietician's recommendation I'm spiking some of Amber's food with coconut oil and frying a lot of Amber's food in it. Fred and I don't eat fried food; it literally makes me a bit anxious to serve Amber food that has been fried. I just don't make that kind of food. 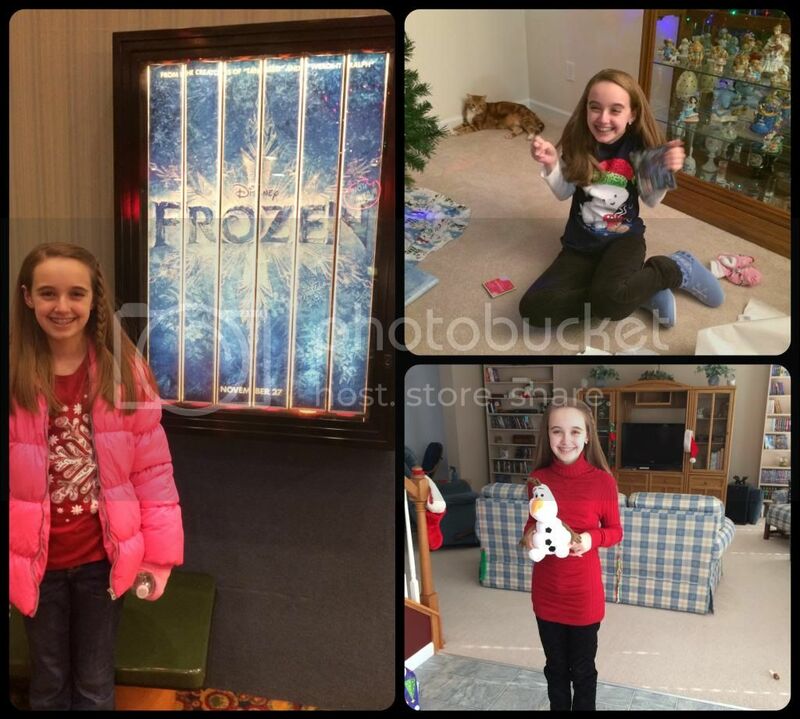 Amber's new obsession - Frozen. We have seen it 3 times already! She wants to find time for a 4th too. She promptly needed a stuffed Olaf and received the Frozen DS game for Christmas. So, Amber may be out of dance for a bit this semester, or for the whole semester. We will see how this goes. Honestly, I'm not sure Amber is currently capable of the energy requirements needed for dance. She gets exhausted walking from the parking lot into Target. Her intestines are still healing and trying to learn how to absorb nutrients again. It might be a blessing for the GI doctor to order the dance hiatus than for Amber to attempt to push through it. Amber has already indicated that she is going to fight me tooth and nail if I try to pull her from dance on only my own better judgement. Stubborn mini-me child. Sometimes I wish she had her dad's personality. During Christmas break we've been playing a lot of new games that Amber received for Christmas. The surprise hit was a game I found on Amazon that had excellent ratings and comments. It's called Castle Panic. It is entirely cooperative play and suits Amber's personality perfectly. She can compete against the game, but doesn't have to be so anxious because the decisions are not on her alone. There is an expansion set to the game that she has already requested for her birthday in a week. Amber and I have been working our way through the LEGO Marvel Superheroes PS3 game too. Shockingly, Amber knows a lot more of the characters than I expected because she reads the comics in the LEGO magazine. Fred still doesn't like the LEGO games, but is interested in the characters and how they are portrayed because, as he put it "I have most of those comics in boxes in the basement." Amber declared her dad a "geek" at that point. LOL. (TOP-LEFT) Amber's Christmas Eve pajamas - matching set for her and her My American Girl doll. I've been working, slowly, on reviews of curriculum we finished this semester and preparing for our coming semester of school. I think Amber will be capable of fuller days if we shift our schedule to start closer to lunch, or after lunch, and finish close to dinner time. I intended for school to start Monday, the 6th, however Amber now has two different appointments on Tuesday the 7th making school that day an unlikely event. In all probability we won't do much more than math on Monday and wait for Wednesday to begin our semester. We have managed to entirely migrate Amber's playroom from an elementary girl's area to a tween (almost teen!) area. Gone to the basement play area are most of the toys that I never dreamed Amber would part with so easily. The basement play area also was cleaned. We kept only a very few favorites as mementos, donating the rest. Even Amber thinks things feel better without so much clutter. As requested by Amber, the American Girl dolls, of which Amber received number 7 (!!!) for Christmas, have a more prominent home in the playroom, as well as the LEGO building / imaginative play table. 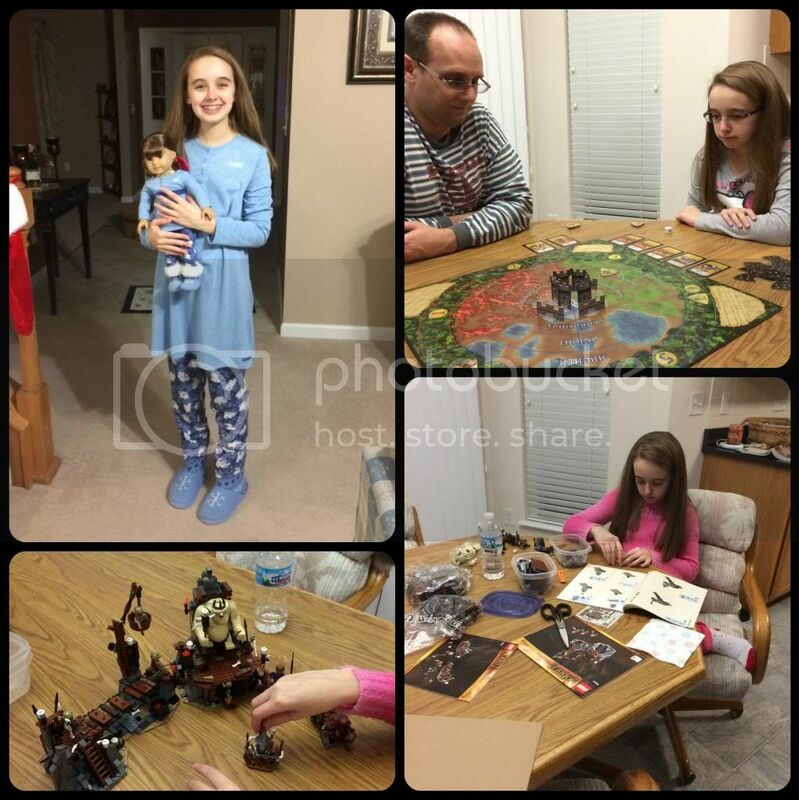 Amber also received the LEGO Hobbit Hole and LEGO Goblin Kingdom sets for Christmas and she has been building away with those. They now reside next to the Orthanc and Rivendell set. Hopefully, there won't be too many more additions at her birthday. (TOP-LEFT) My Christmas gift from Amber made in her art classes. It's so precious to me. (TOP-RIGHT) Christmas Eve picture. Amber promptly became ill during church... minor food reaction we think. 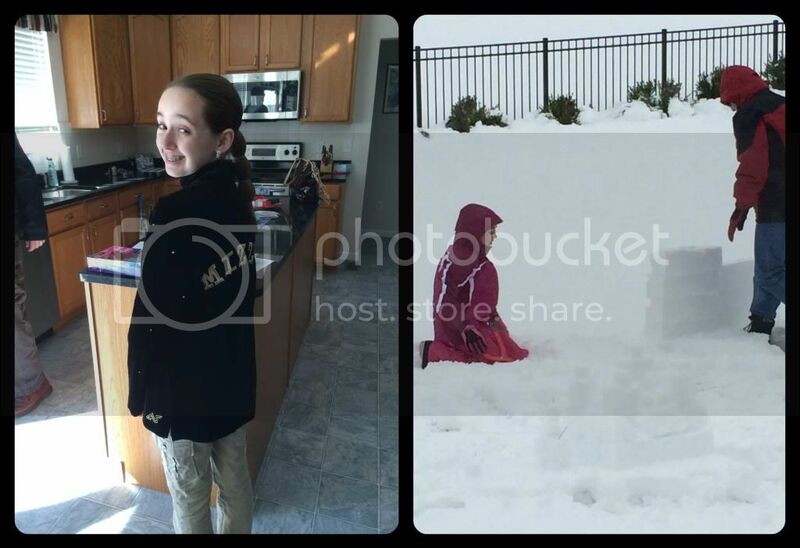 (BOTTOM-RIGHT) New American Girl doll (Caroline), new Snow Much Fun doll set, old winter doll winter outfit. I've spent a lot of time working on electronics around the house. We gave ourselves a new PS3 slim for Christmas, because we are not enamored with the PS4. All the saved games and data needed to be copied to the new PS3 and the old one moved to the bedroom TV (woo-hoo, we now have streaming video upstairs too). Amber has been begging for a 3D TV, but that just wasn't in the cards for Christmas. I'm not sure I'm ready for the upheaval it will bring to our whole entertainment setup either. We also bought my mom a new computer for Christmas as the one we gave her a couple of years ago has been acting flaky. Mom is not a computer savvy person, so the random problems make it difficult for her to depend on it. Instead of buying Amber a new computer, we decided to give it to Mom and gave Amber the quirky computer that is much more easily maintained by two computer science majors. Amber is over the moon with having a desktop again instead of my old laptop. She also has moved to Windows 7 from Windows Vista. I greatly dislike Windows 8, so we are still buying new computers here with Windows 7. Call me old and crotchety, but Windows 8 makes me want to switch to Macs. (LEFT) Amber's new Mizzou Golden Girls (dance team) jacket. Thanks Aunt Stephanie! (RIGHT) Our pre-Christmas snow of 7 inches. It's turning out to be a snowy winter. We are preparing today for a huge snow storm to hit tomorrow and Sunday. They've already issued the watch and we still have snow on the ground from Thursday. Our expected high temperature on Monday is -2 (yes, that is a negative sign). This is Missouri people, not the arctic circle. I'm a little concerned (umm.. maybe more than a little) about my sister's family and my mom who will be driving back on Saturday from watching Mizzou in Cotton Bowl in Texas. They will be trying to make it ahead of the snow storm that is expected to bring near blizzard conditions. Mom will then be stranded at my sister's house for a few more days as my sister lives a couple hours closer to Texas (but still in Missouri). Prayers for their safe travels would be appreciated. This weekend we plan to be snowed in but with such temperatures that outside play is dangerous. We will probably play more with our Christmas goodies, test some birthday cookie / cake recipes for Amber, and finish prepping for a new semester of school. Hi, I'm stopping by from Weekly Wrap Up. I began eating gluten free this year for health issues. My sister has Celiac Disease and eats gluten free. I'm always interested in reading about how other people with food allergies and sensitivities are adjusting. I'm sure it's so much harder as a kid because eating differently makes you feel different from anyone else. We adapted our sugar cut out cookies this year, and I tried a gluten free recipe. It did have sugar though. My sister in law gave me a great book - Healthy Gluten Free Living. It has recipes that leave out gluten, but many are also Vegan and she doesn't use sugar often. She uses some natural sweeteners, and she uses lots of coconut oil. I'm highly gluten intolerant myself, but without Celiac disease. We've been gluten free since longer than Amber was diagnosed with fructose malabsorption. We love the Gluten Free on a Shoestring blog and the books that Nicole (the blog owner) writes. The tolerance of people with fructose malabsorption is so individualized and that's the biggest issue. If they could just tell me what Amber could tolerate and in what amounts we would be set. It's the wondering, the hidden ingredients, the detailed food logs, the food trials, and watching her for any little symptom. The chance that a food works at 1/8 of a cup but will trigger a horrid reaction at 1/4 cup. This is the real pain with fructose malabsorption. We also can't use most natural sweeteners for Amber because they have hidden fructose. No honey, no agave syrup, no molasses, or brown sugar. Amber reacts to many artificial sweeteners too (not because of fructmal). The only safe sweeteners we have found are dextrose powder and small amounts of pure cane sugar (no beet sugar). She tolerates (we think) pure stevia extract, but again it's a quantity issue. She can have a tiny bit, but more than that she has an allergic reaction. But Amber is lucky. There are many kids out there with both Celiac and Fructose Malabsorption. I just can't imagine the pain they go through. You are getting so much done over you break. I will have to try that bread. We have been testing rice and it seems ok in small quantities. I am glad you are finding ways to make the diet work. I hope the coconut milk works. My son like the coconut ice cream. I'm glad that rice seems to been working in small quantities. We find that a lot too. Stuff works in small quantities, but not even in moderate ones. Rarely do fructmal kids react to coconut milk or cream, but it still needs a formal trial of it's own. Prayers for safe travels. We are going over a mountain pass next weekend so we are praying that no storm comes. I have given us an extra day just in case. Amber's birthday is very close to Philip's. He turns 12 on the 17th. I gave up on Windows years ago. Most are now Ubuntu. My wife's work laptop is Apple and we have one older Windows Vista Laptop that Ian uses mostly. I like the look of Castle Panic. It will have to wait a couple of months. They got too much stuff for Christmas. I loved reading this update Christy. I am glad Amber is doing a bit better. It looks like you all had a wonderful Christmas. We just saw Frozen and loved it. There is a really cute tutorial on YouTube on how to draw Olaf. Search for DoodleDrawArt Olaf. I just love all the things Amber does and love the Christmas picture of you both. Hope you stay safe and warm the next few days!!! Stay safe and warm! We got hit by the Thursday storm. I have no idea of we are expecting another on! Hope not. I love the Christmas photo of you and Amber. You both look so festive and pretty! I'll have to check out Castle Panic. It sounds like a game that my clan would enjoy! I understand your conflict with dance. We took Bethany out of school (3 times) because her health deteriorated so badly when she went. We finally gave it up for good. Now we are going to try out a social club On Jan 12th. I excited and worried at the same time that 45 minutes a week might be too much for her. As always, thanks for linking up to FF. I love to hear from you! First of all … MIZ! It was funny to see Amber putting together her Lego set because that is exactly how we do it … pull out the plastic dishes!